Ann Leckie’s The Raven Tower is a standalone secondary-world fantasy. Mawat’s story may sound familiar: a northern kingdom; an heir who learns that his father has disappeared and that his uncle has seized power. Before humans, there were gods. Gods struggled and negotiated among themselves. With the coming of humans, gods could draw upon the worship of humans for more power. One god, Raven, led his followers to build the fortress of Vastai and seize power over a strategic strait linking an inland sea to the ocean. Vastai levies dues on trade and grows wealthy. 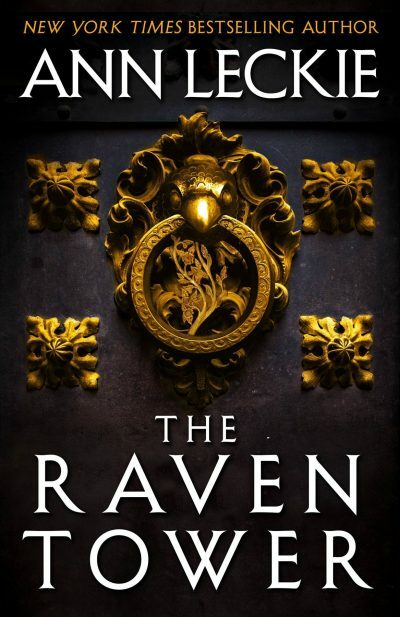 There is a price: Raven must have a human life now and then, to maintain his power. The designated sacrifice is called the Lease. The Lease enjoys power and influence until he must die as a sacrifice to Raven. Until now, each Lease has willingly died to keep the bargain. Mawat returns home to discover that his father has vanished and that his uncle Hibal has proclaimed himself Lease. Mawat believes his father must be dead; it is unthinkable that a Lease would flee the bargain. Mawat is also sure that Hibal must in some way be responsible for disappearance. But Mawat cannot convince the ruling council that he is right; he has suspicions, but no proof. But this isn’t really Mawat’s story. It is the story of his faithful servant Eolo. The easily provoked Mawat struggles futilely to win that which is rightfully his by shaming the powers-that-be; Eolo quietly investigates. The powers-that-be are confident that they understand how Vastai and its gods work. They are wrong. Eolo learns the truth but who will listen to a mere servant? Aside from a god, that is. Two books written in second person in as many weeks. What are the odds? The book is narrated by a god, Strength and Patience on the Hill. Strength is so ancient that it remembers trilobites; it has watched ice ages come and go, mountains rise and fall like waves. It takes the form of a very large rock. It could shift its consciousness into another, mobile, form, but refuses. It is a little set in its ways after a few billion years as a rock. Strength addresses Eolo. In this way it tells us what is happening to Vastai, Mawat, Hibal, Eolo. There is a small story inside a long story. Leckie alternates skillfully between the two threads, the small story and the long one. Each thread gives the reader some clues to understand what is happening, something that may seem opaque when one first opens the book. Just as Leckie did in the Imperial Radch trilogy, she plays with inclueing, pulling the reader into the effort to make sense of the setting. Which in turn helps solve the mystery of the missing Lease. It’s a small mystery inside a bigger one. The book is also a beautifully written meditation on the passage of time and seasons. Read slowly and enjoy. The Raven Tower is available here (Amazon) and here (Chapters-Indigo).